Some great Tower 37 reviews appeared online recently, posted by folks who saw the film at the San Francisco International Film Festival. "...My personal favorite short is The Incident at Tower 37. This seemingly simple story is loaded with political and moral undertones, making it far more challenging than many viewers may realize. This particular short alone makes the entire program worth it." "...In Chris Perry's brilliant short entitled The Incident at Tower 37, one of the on-duty guards at a corporate-run well designed to drain a lake of every drop of water has his resolve weakened by a strange amphibious creature. 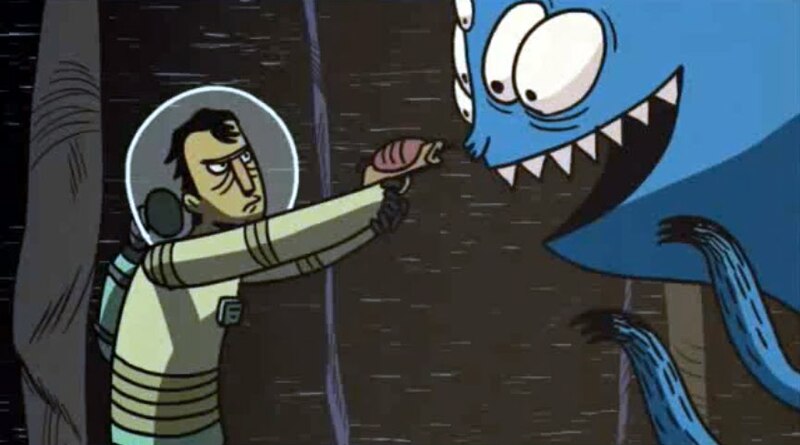 The pangs of guilt which overcome the lone employee of a powerful conglomerate in The Incident at Tower 37 actually have an important consequence: In a moment that defies corporate logic, the man on duty in Tower 37 realizes that his actions are destroying an entire ecosystem and he reverses the flow of water. The quality of the artwork in Perry's HD animation short is absolutely breathtaking. His film about preserving the environment becomes all the more compelling in light of the recent environmental crisis in the Gulf of Mexico (thanks to BP's catastrophic oil spill)." "A fable about a man, water, and intelligent frog-fish creatures. Visually stunning CGA that could have come out of Pixar." 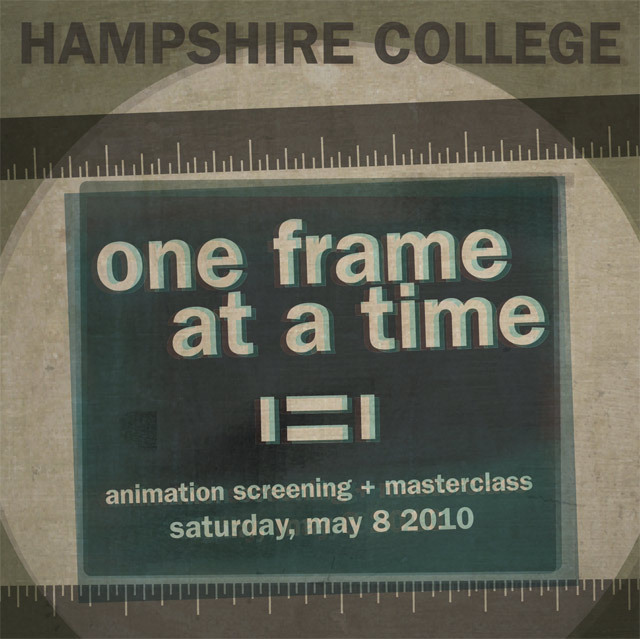 The One Frame at a Time animation event at Hampshire went great last weekend. I thank our filmmakers for exposing us all to some outstanding work (including older films by Raoul Servais and Georges Schwizgebel -- both embedded below), and for sharing their production methods with those who attended the master class. The nice thing about a flexible, participant-curated show is that we could squeeze in some other treats, like Bill Plympton's new short "The Cow Who Wanted to be a Hamburger" (clip below) and a 16mm print of a Mr. Magoo "Fuddy Duddy Buddy" hand-delivered to the screening by Emily Hubley. I hadn't yet seen Bill Plympton's new short even though it has been collecting awards at many festivals lately. It was a lot of fun, and there was a great resonance with my interests of late since I've been researching food and agriculture for another project. I also smiled at the parallels between the young cow and the young protagonist of my short Catch from 2005 - both have at least some portion of their lives shaped by billboards! Thanks to all who attended and participated. With luck we'll be able to repeat this process next year and bring a new slate of animation work to viewers in the Valley. I have no good excuse but many poor ones for not posting this event earlier. With luck, however, today's article in the Daily Hampshire Gazette/Amherst Bulletin or yesterday's lovely Tower 37 review on George Heymont's blog will help draw a good audience for the show. Three award-winning independent animators will be at Hampshire College this Saturday hosting a master class in the afternoon and a screening in the evening. Both events are free and open to the public, but there are limited seats for the master class so priority for those spots will be given to current 5-college students. Aaron Hughes and Lisa LaBracio, director and producer (respectively) of "Backwards," and Jake Armstrong, director of "The Terrible Thing of Alpha-9!" 3-4pm, MASTER CLASS: The animators will present the workflows from their respective projects. The format will be casual, with audience questions encouraged. Location: Adele Simmons Hall room 126 (the ASH lab). 6-7pm, SCREENING: There will be a screening of indie animated shorts selected by the participating filmmakers and the event organizers. This is NOT an all-ages show, and it will START ON TIME so that people can make it to other events on campus that evening. Location: Franklin Patterson Hall, Main Lecture Hall. The program is ever-evolving, but is likely to include the following films. Follow the links below for samples, but save your real appetite for the screening!